This page presents a glossary of key terms related to the study of past environmental conditions and is aimed at researchers and those interested in related disciplines who benefit from some understanding of palaeoenvironmental sciences to advance multi-disciplinary projects. Palaeoenvironmental sciences apply the scientific method toward observing, describing, and understanding earth system process that have operated in the the past and have led to the abiotic and biotic interactions that operate on Earth today. With such information it can be possible to understand how the future of the Earth may evolve and the ecosystem responses to the many changes occurring to Earth’s environments. The suffix, Palaeo-, comes from Greek παλαιός meaning “old, ancient” and is used for many of the disciplines in palaeoenvironmental sciences, such as paleontology, palaeogeography, palaeobotany, and palaeoclimatology. Palaeoenvironmental archives (sometimes called geoarchives) are naturally occurring sources of accumulating or growing material that locks in and preserves information about the surrounding environment. For example, the sediments depositing in a lake accumulate and preserve a record of the conditions surrounding a lake. As the sediments pile up they can maintain this record over hundreds, thousands or more years, and can be studied using palaeoenvironmental techniques. Other palaeoenvironmental archives include other sediments from terrestrial and marine sources, cave deposits, volcanic deposits and glacial ice. Biogenic sources can include growth rings in shells and bones, and tree rings. Other sources of past environmental conditions include historical accounts, archaeological information, weather station data, and historical photographs and maps. The study of contemporary and fossil microscopic organic remains (“palynomorphs“), including pollen and spores. Siliceous and calcareous remains of organisms, such as the exoskeletons of diatoms and foraminifera are not included in this field. An integral part of palaeoecological research, palynology can yield important data on species composition and change therein over time, and acts as a proxy for different environmental factors. 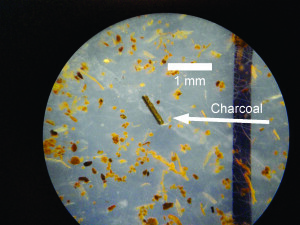 Microscopic organic plant and animal remains found in sedimentary rock and sediment cores. These include pollen, vascular plant spores, fungal spores, algal spores, dinoflagellate cysts, and arthropod remains. Palynomorphs typically range in size from about 5 μm to 500 μm, they require specific conditions to survive making them useful indicators of climate and environment change. A piece of macroscopic charcoal from Rumuiku Swamp, Mt Kenya, Kenya (Rucina et al, 2009). Charcoal and ash result from the incomplete burning of biomass from natural and anthropogenic fires. Charcoal accumulates in depositional environments, such as soils, swamps, lakes, oceans and ice, and can be classified by size fractions that largely relate to the distance it is transported from the source fire. Microscopic charcoal, often macroscopic charcoal, >100 μm, may only be transported from within the watershed or tens of kilometers during high-convection fires (Pisaric, 2002; Tinner et al., 2006). Larger, megascopic charcoal may be deposited where it is produced and be found in soils, sedimentary rock, and extrusive volcanic rocks. 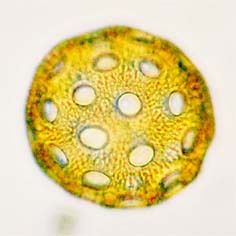 Diatoms are photosynthesizing alage, and among the most common types of phytoplanktom. Most diatoms are unicellular, although they can exist as colonies in the shape of filaments or ribbons (e.g. Fragilaria), fans (e.g. Meridion), zigzags (e.g. Tabellaria), or stars (e.g. Asterionella). They are enclosed within a cell wall made of silica (hydrated silicon dioxide) called a frustule. These frustules show a wide diversity in form, but are usually almost bilaterally symmetrical, hence the group name. Fossil evidence suggests that they originated during, or before, the early Jurassic Period. Only male gametes of centric diatoms are capable of movement by means of flagella. Diatom communities are a popular tool for monitoring conditions of the past and present (because the silica cell walls do not decompose, diatoms in marine and lake sediments can be used to interpret conditions in the past). Palaeoecology is a field that utilizes both living and sub-fossil diatom valves that are preserved in marine and freshwater sediments, and are commonly used in studies of water quality(as they have specific salinity, temperature and other environmental tolerances). All palynomorphs found in a sample that are not pollen, typically referring to fungal and algal spores. Pollen in plants is used for transferring haploid male genetic material from the anther of a single flower to the stigma of another in cross-pollination. In a case of self-pollination, this process takes place from the anther of a flower to the stigma of the same flower. The earliest reported observations of pollen under a microscope are likely to have been in the 1640s by the English botanist Nehemiah Grew who described pollen, the stamen, and correctly predicted that pollen is required for sexual reproduction in flowering plants. Magnetic Susceptibility is basically how ‘magnetisable’ a material, it is a measure of the strength of the reaction to a magnetic field. The reaction whether extremely weak or strong tells us what elements are found in the sediment. For example soil containing iron oxide will have a high magnetic susceptibility as it is highly magnetic while others containing quartz will not show a visible reaction to the magnet. It is important as it acts as an indicator of soil properties such as waterlogging and processes such as burning. Sediments and sedimentary rock are composed of various clastic, biogenic and chemical deposits that accumulate in a basin. By investigating the size distributions of these sediments informs us about the energy regime that transported and led to the deposition of this material. How the energy regime changed through time can also give us palaeoenvironmental information that can help us interpret other important changes in fossil material, giving a more holistic interpretation of past environmental conditions. The various techniques of particle size distribution analysis are succinctly presented by Syvitski (2007). Sediment organic and carbonate content can be calculated from the weight loss from burning the sediments in an oven at different temperatures (Heiri et al., 2001; Wang et al., 2012). Pisaric, M. F. (2002). Long-distance transport of terrestrial plant material by convection resulting from forest fires. Journal of Paleolimnology, 28(3), 349-354. Rucina SM, Muiruri VM, Kinyanjui RN, McGuiness K, Marchant R. 2009. Late Quaternary vegetation and fire dynamics on Mount Kenya. Palaeogeography, Palaeoclimatology, Palaeoecology 283: 1-14. Syvitski, JP (Ed.). (2007). Principles, methods and application of particle size analysis. Cambridge University Press. Tinner, W., Hofstetter, S., Zeugin, F., Conedera, M., Wohlgemuth, T., Zimmermann, L., & Zweifel, R. (2006). Long-distance transport of macroscopic charcoal by an intensive crown fire in the Swiss Alps-implications for fire history reconstruction. The Holocene, 16(2), 287-292. Wang, X., Wang, J., & Zhang, J. (2012). Comparisons of three methods for organic and inorganic carbon in calcareous soils of northwestern China. PlOS one, 7(8), e44334.